Located where the Montreal River drops down to Lake Superior, Montreal Falls is a must visit when you are in the Keweenaw Peninsula. The falls cascade down rugged rocks slides before finishing at the lake below. The area is extremely beautiful and worth the visit. One unique feature is the view looking out over Lake Superior from the top of Montreal Falls. 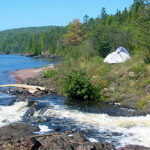 There are some flat areas with fire rings that can be used for camping, as well as a beautiful beach that many kayakers use to begin or end their Lake Superior paddle. Montreal Falls actually consists of two separate drops and a narrow hiking trails connects the Upper Falls with the Lower Falls. To reach Montreal Falls, drive north on US41 until you come to Lac La Belle Road. Turn right on it and follow it through the town of Lac La Belle and all the way through Bete Grise until you come to a dirt road called Smith Fisheries Road. Turn left onto it and follow the blue signs/blazes/spraypaint until you reach the Smith Fishery itself. Park there and continue along the dirt path for another 1.5 miles or so until you reach the falls. 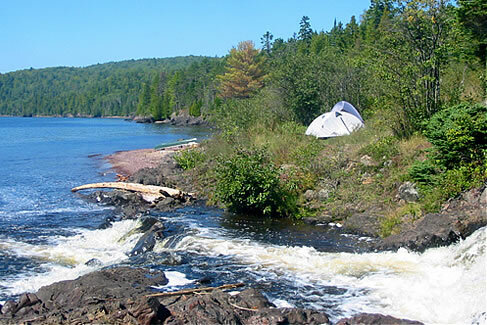 The trail is gorgeous, following the Lake Superior shoreline to the falls. Use the map below to reach the falls.